This annual guide to corporation tax meets the everyday needs of the busy tax adviser. 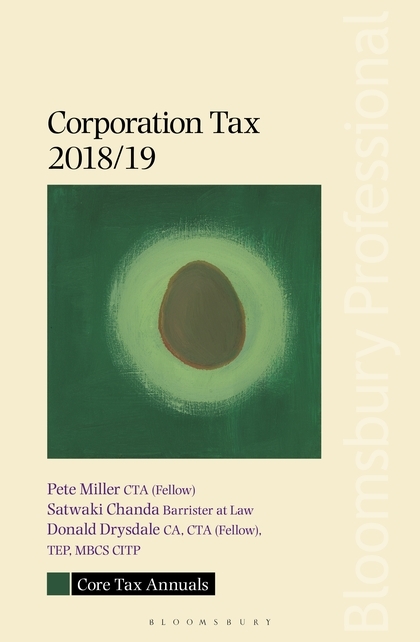 A collaboration by leading tax writers Pete Miller, Satwaki Chanda and Donald Drysdale, Corporation Tax 2018/19 examines the rules, regulations and tax issues affecting companies in the UK. With its practical and concise style and straightforward format, this book is a useful tool for tax advisers and non-experts alike. This accessible reference guide has a user-friendly structure with ‘signposts’ at the beginning of each chapter to summarise key topics and ‘focus points’ throughout to highlight important issues. Numerous worked examples demonstrate how to apply the main principles in practice and all examples are listed in a table at the beginning for quick navigation.